Although I’m oddly fixated on making Christmas cookies, decorations, and gifts right now, I had to throw myself in full throttle reverse to make sure I stopped and focused on Thanksgiving. After all, it is fast approaching. I know, can you believe it? Honestly, where does the time go? Over the years, I’ve gotten in the habit of making little favors or place cards to place in front of each place setting on the Thanksgiving dinner table. 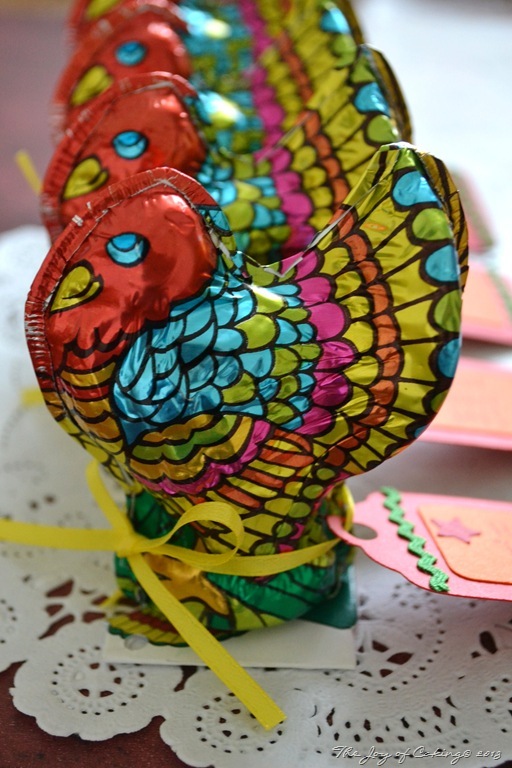 These little decorations are far from sophisticated, but they are always brightly colored and fun, and nearly everyone remembers to take theirs home with them. Here is a quick look at some of my past projects. Check out my 2011project here. This year I decided to make favors that I’m sure that no one will leave behind. If they do forget and leave them behind, I’m just warning them now, it’s fair game! 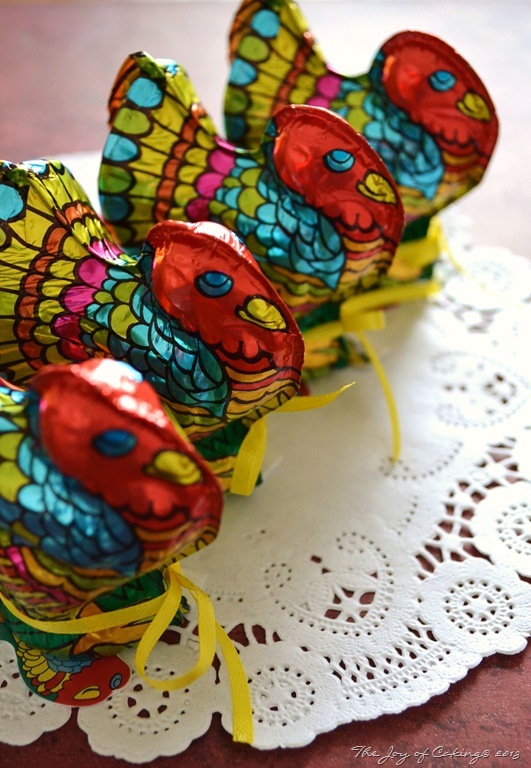 These little foiled turkeys are actually disguised Niagara Chocolates – 100% all natural goodness. If you haven’t had Niagara Chocolates then you MUST try them. They are insanely delicious! What else would you expect from a chocolate that has been in production for over 50 years? If you’re like me, and you’re thinking ahead towards Christmas, make sure you check out all of Niagara’s other delicious holiday themed chocolates too. 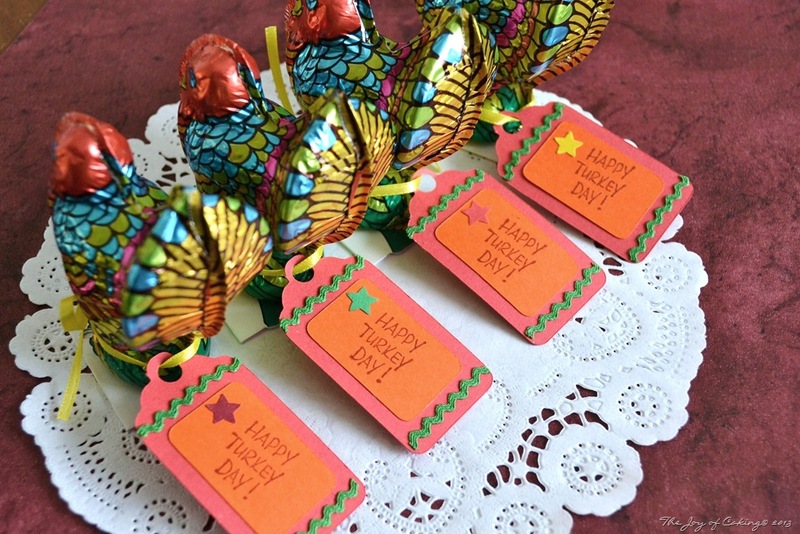 Although these cute little guys came with gift tags already attached to them, I took them off, taped them to the bottom of their feet, and made my own personalized tag for each turkey. Why? Because I enjoy fiddling in my craft room. These tags are easy to make. If you’re looking for a quick evening, or Sunday afternoon project, this fits the bill. Or, hand the project over to your kids – I’m sure they would love to help. 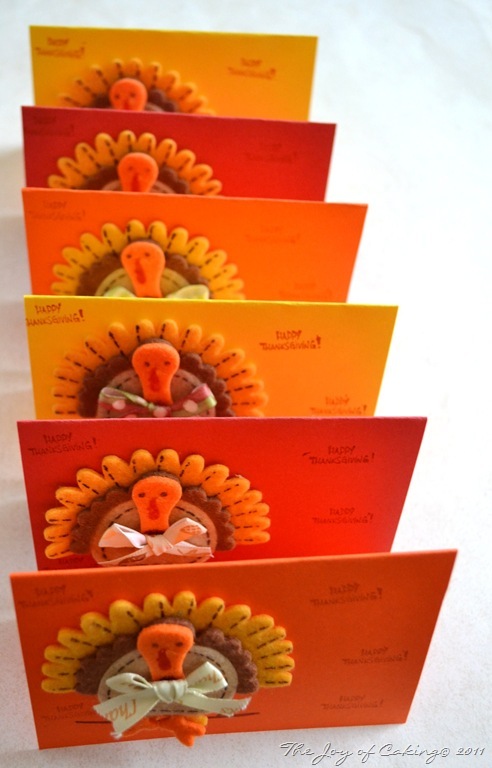 Simply cut out or purchase some plain gift tags (I used my Cricut), stamp a cute Thanksgiving Day theme or word on them, glue on a little rick rack, string a colorful ribbon through them, and that’s it. It’s as simple as eating this whole chocolate turkey in one setting. Do you make favors for your dinner guests? What’s your Thanksgiving Day tradition? The chocolates for this post were provided by SweetWorks Candy. I was not compensated for my work, and the opinions are sincerely my own. 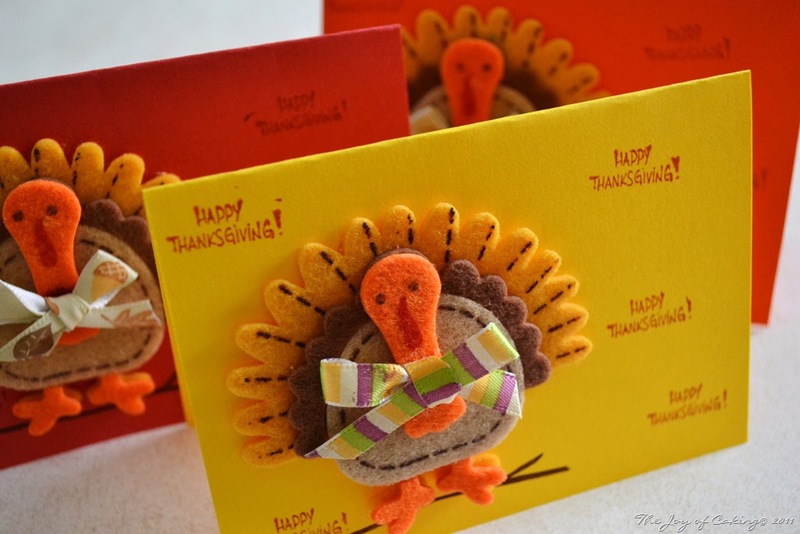 A recent trip through Michaels inspired me to create some cute cards that will sit on guests plates on Thanksgiving day until those plates become loaded with roast turkey and all the fixings. This project is quick, easy, inexpensive, kid friendly and will add color to your holiday table. 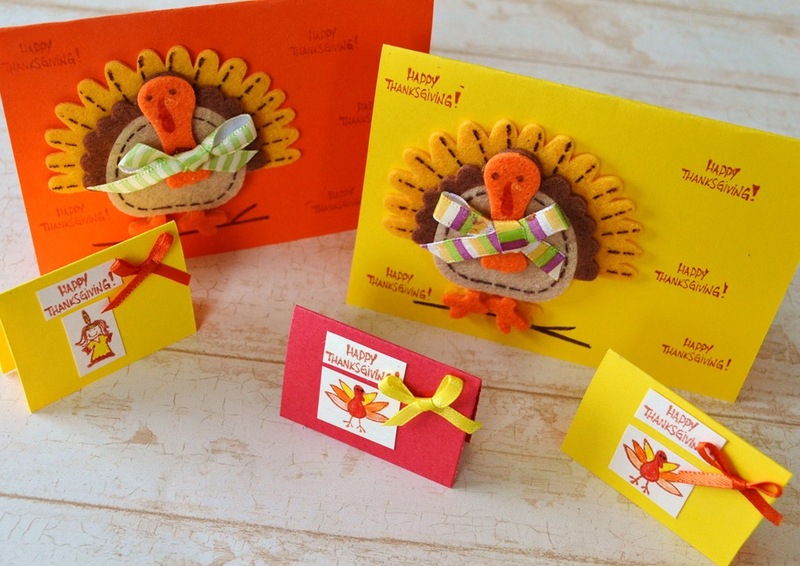 I had all of the materials on hand with the exception of the cute little felt turkeys – which I purchased in a pack of 7 for $3.24 at Michaels. To make this project you will need: an ink pad, stamp, brightly colored card stock, glue stick, brown marker, and ribbon. First, cut the card stock into the size you want your card remembering you will fold it in half. Next, affix your turkey on the card (these turkeys had an adhesive backing) and then draw his perch. Stamp your greeting on the remaining space, and finish it off by gluing small bow made out ribbon on the front of the turkey. You can also monogram each card with the initial of your guests, you can leave a personal message inside for your guests to read, or you can leave it blank and let everyone write what they are thankful for on the inside. Do you prefer to decorate your table with flowers, candles, something else, or just good old-fashioned food?